Glass and tile drill bits provide smooth, accurate drilling in ceramic tile, marble, china, mirrors and glass. 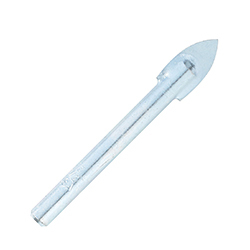 The spear-pointed tip design reduces breakout, and the bit features a carbide tip for extended bit life. These bits are ideal for drilling fastener holes in bathroom tile or wall mirrors.